Dimensions: 4-3/8 x 4-3/8 in. 12 pages. Boardbook. Kids will go crazy for these quirky books featuring lovable characters, vivid art, rhyming text, and best of all, cute finger puppets! Watch Little Owl snuggle down to sleep and Snow Baby discover winter’s magic in these simple, comforting stories. 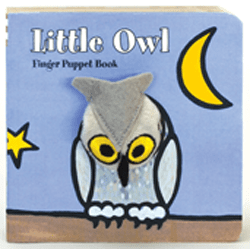 Each book features a permanently attached plush finger puppet and peek-a-boo holes in every page, presenting a super-fun way for parents and children to play and read together.